Lactoferrin (LF), also known as lactotransferrin (LTF), is a multifunctional protein of the transferrin family. Lactoferrin is a globular glycoprotein with a molecular mass of about 80 kDa that is widely represented in various secretory fluids, such as milk, saliva, tears, and nasal secretions. Lactoferrin is also present in secondary granules of PMN and is secreted by some acinar cells. 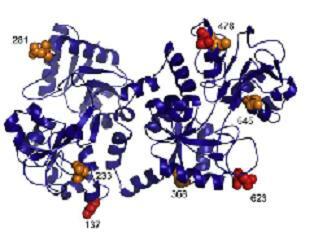 In humans, lactoferrin gene LTF is located on 3q21-q23. In oxen, the coding sequence consists of 17 exons and has a length of about 34,500 nucleotide. 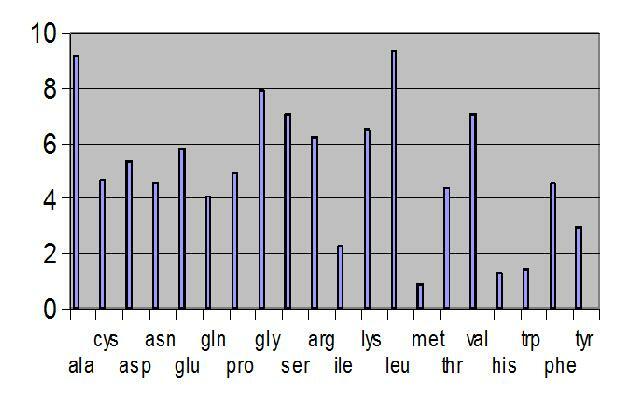 The size of the gene varies from 23 to 35 kb among human mouse and bovine species. 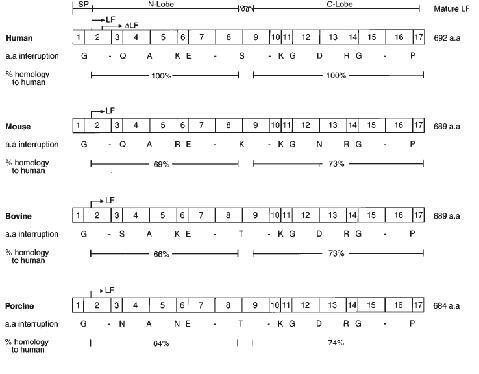 However, the number of exons in the gene and the number of amino acids encoded by 15 of the 17 exons are identical among them. Lactoferrin is highly conserved among human, mouse, bovine species. Lactoferrin is a glycoprotein with a molecular weight of about 80 kDa, which shows high affinity for iron. This multifunctional protein is comprised of a single polypep­tide chain containing 703 amino acids folded into two globular lobes. There is a notable degree of internal homology between the two lobes (residues 1-338 and 339-703, respectively),which demonstrates 125 (or 37%) identical amino acid residues in the corresponding portions. 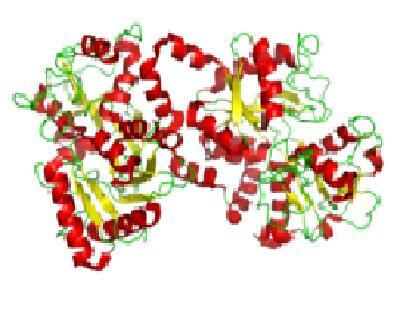 Lactofferin is a basic glycoprotein with an isoelectric point of 8.7. It is folded into two large lobes, also called C – (carboxy) and N – (amino) terminal regions, bridged by an α-helix. Each lobe consists of two domains known as C1, C2, N1, and N2. The do­mains create one iron binding site on each lobe. Two ferric ions can be bound by one lactoferrin molecule. One carbonate ion is always bound by lactoferrin concurrently with each ferric ion. Four amino acid residues are most important for iron binding (histidine, twice tyrosine, and aspartic acid), while an arginine chain is responsible for binding the carbonate ion.The role of the carbonate anion is proposed to be twofold: it neutralizes positive charges which might otherwise repel the cation, and it partially prepares the metal binding site on the apo-protein by adding two more potential ligands. Essentially identical iron binding sites are found in both N- and C-lobes of all Lfs and almost all Tfs. This canonical binding site is repeated in both lobes of human, bovine, horse and buffalo Lfs, and in the equivalent binding sites in transferrin. Lactoferrin molecules contain (according to the species and protein) varying numbers of sites for potential glycosylation, mostly on the surface of the molecule ( Asn137, Asn476 and Asn623). Only two sites are usually glycosylated in human Lf (Asn137 and Asn476). The most common sacharide is mannose; around 3% are hexoses, and 1% hexosamines. The degree of glycosylation varies and determines the rate of resistance to proteases or to very low pH. The biological properties of lactoferrin are medi­ated by specific receptors on the surface of target cells. These receptors are typical for each cell type and can be found, for example, on mucosal epithe­lial cells, hepatocytes, monocytes, macrophages, polymorphonuclear leukocytes, lymphocytes. Specific receptors (SI-LfR), present on enterocytes, mediate binding of lactoferrin. The part of the N-lobe (residues 1-90) is involved in lactoferrin receptor binding while the C- and N-lobes of human lactoferrin bind to bacterial lactoferrin receptors. Lactoferrin is produced in neutrophils and stored, in the iron depleted state, in the specific granules and possibly in the tertiary granules. 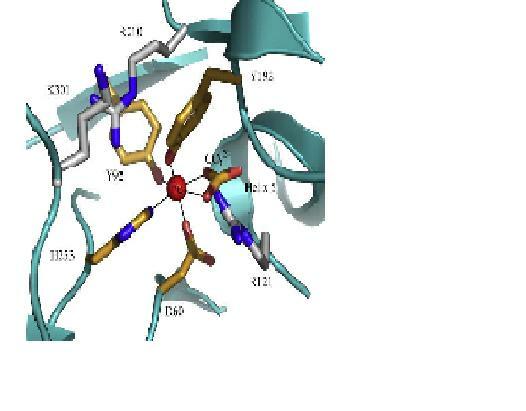 This protein, unlike myeloperoxidase and some other granular products, is not synthesized as a larger precursor and was found to be unphosphorylated. Lactoferrin transfer to its storage granules is dependent on acidification mechanisms and occurs through the medial and transcisternae of the Golgi apparatus. It therefore appears to be processed like proteins destined for secretion. The neutrophil lactoferrin within these granules has two destinations: it can either be secreted into the surrounding tissues or blood, or the granules can fuse with phagosomes. Secretion from polymorphonuclear cells into the circulation is dependent on degranulation factors, which in turn appear to be dependent on the activation of guanylate cyclase, cGMP and proteinkinase C (calcium dependent). This occurs in both aerobic and anaerobic conditions, is unaffected by the presence of hydrogen sulphide and is stimulated by interleukin-8 and surface bound IgG. Lactoferrin levels in amniotic fluid were found to be undetectable before the 20th week of pregnancy. A significant increase occurs around week 30, whereafter it remains high until term. Lactoferrin removal from circulation appears to occur in one of two ways: first, lactoferrin can be removed from the circulation, as well as from the interstitial spaces, by what would appear to be receptor-mediated endocytosis into phagocytic cells such as macrophages, monocytes and other cells of the RES, with subsequent transfer of the iron to ferritin. The alternative way of lactoferrin removal would be its direct uptake by the liver through an iron saturation-independent, clathrindependent, calcium-dependent process of endocytosis. Lactoferrin belongs to the innate immune system. Apart from its main biological function, namely binding and transport of iron ions, lactoferrin also has antibacterial, antiviral, antiparasitic, catalytic, anti-cancer functions and properties. The ability of lactoferrin to inhibit bacterial growth in vitro was one of the earliest functions described for the protein, and was shown to be due to sequestration of the iron in the medium required for microbial metabolism. Subsequent research has shown that iron sequestration by lactoferrin caninhibit growth of many species of bacteria (and fungi) in vitro, although some can counteract the inhibitory effect through synthesis of low molecular weight high affinity chelators (siderophores) or by production of specific lactoferrin receptors that can facilitate iron removal from the protein. This anti bacterial property has been identifed in all mammal species. Milk lactoferrin levels are usefull for neonate and infant, who immune system isn't developed, in order to prevent bacterial infection. This protein plays, also, an important role of prevetion in mucosal areas limiting the interaction of bacteria with epithelium. Probabily is for this reason that evolution preserves lactoferrin protein in nature. There is a second antibacterial mechanism, which is independent of iron-binding and involves the basic N-terminal region of lactoferrin. This antibacterial action of lactoferrin is explained by the presence of specific receptor on the cell surface of microorganisms. Lactoferrin binds to lipopolysaccharide of bacterial walls, and the oxidized iron part of the lactoferrin oxidizes bacteria via formation of peroxides. This affects the membrane permeability and results in the cell breakdown. Lactoferrin not only disrupts the membrane, but even penetrates into the cell. Lactoferrin also acts against the Candida albicans – a dipolid fungus (a form of yeast) that causes opportunistic oral and genital infections in humans. Lactoferrin is capable of binding certain DNA and RNA viruses. Nevertheless, its main contribution to antiviral defense consists in its bind­ing to cell membrane glycosaminoglycans. 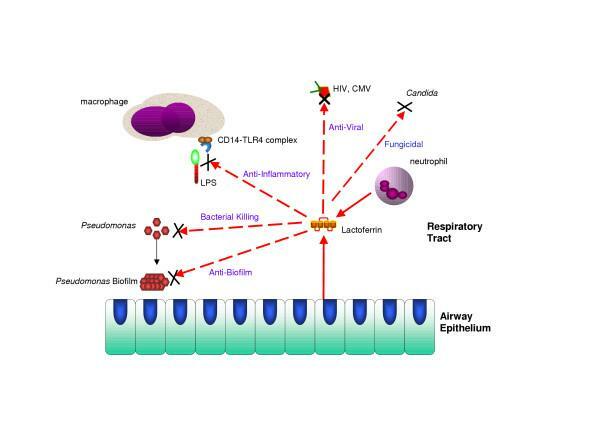 In this manner lactoferrin prevents viruses from entering cells and infection is stopped at an early stage. Such a mechanism has been demon­strated as being effective against the Herpes simplex virus, cytomegaloviruses and and the human immunodeficiency virus. Lactoferrin acts against parasites in various ways. It is thought that lactoferricin breaches parasitic membrane integrity causing subsequent changes in interactions between the host and the parasite. The competition for iron between the parasite and lactoferrin is the basis of its antiparasitic activity. In contrast, some parasites such as Tritrichomonas foetus are able to use lactoferrin as a donor of ferric ions. cytokines are reduced. Another potential anti-inflammatory role of lactoferrin is through the sequestration of “free” iron at inflammatory foci, such as rheumatoid joints, thus preventing catalysis of the production of damaging free radicals. These anti-inflammatory effects of lactoferrin are probably initiated following release of lactoferrin from neutrophils, and could thus be viewed as a further manifestation of the role of neutrophils in inflammation. 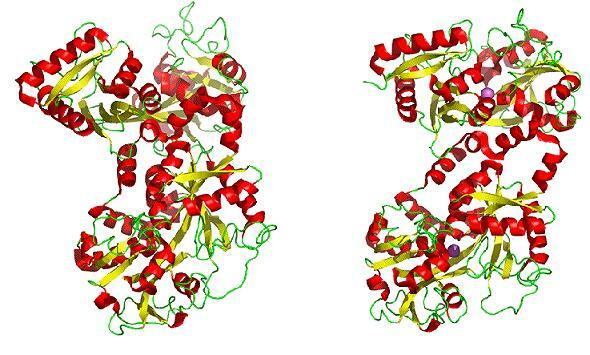 The regulation of lactoferrin synthesis depends on the type of cells producing this protein. The amount of lactoferrin synthesized in the mammary gland is controlled by prolactin whereas its production in reproductive tis­sues is determined by estrogens. Exocrine glands produce and secrete lactoferrin in a continuous manner. In neutrophils, lactoferrin is synthesized during their differentiation (when promyelocytes develop into myelocytes) and is afterwards stored in specific granules. Plasma lactoferrin levels generally increase in iron overload, inflammation, infectious diseases, and during tumor development, demonstrating a multifactorial stimulatory mechanism for lactoferrin release from neutrophils. pancreatitis, cystic fibrosis ,septicemia,congenital aplasia of the vasa deferentia and seminal vesicles, schizophrenia,joint inflammation and cartilage degradation,psoriasis and rheumatoid arthritis. Lactoferrin antibodies have been demonstrated in patients with Felty’s syndrome, and the detection of these antibodies may prove useful in its diagnosis.It has further been suggested that b-lactoferrin/RNase and g-lactoferrin/RNase may be of value in the detection of breast cancer.